I thought you might enjoy some more Portal tats to add to your collection. I’d been wanting to get a geek tat for a while but could never think of what I wanted to represent awesome nerdiness. Then Portal came along. Portal arrived during a period of gaming where, for me, NOTHING new was happening, and that game really reignited my love of video games. The fact that the game is peppered with perfectly tattooable icons was a major bonus. When I first had them done, a group of youths were walking behind me trying to figure out what they represented. 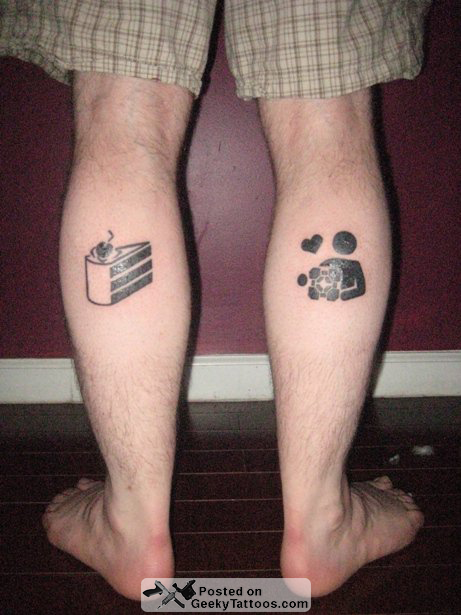 They finally decided it meant I loved cake and video cameras. Tattoos done at Fun City Tattoos in the East Village. Check out the other Portal tattoos I’ve posted. Posted in Portal, Tattoos, Video Games. Tagged with calf, calves, Fun City Tattoos, portal. Mike, marry me. A thousand times, marry me.